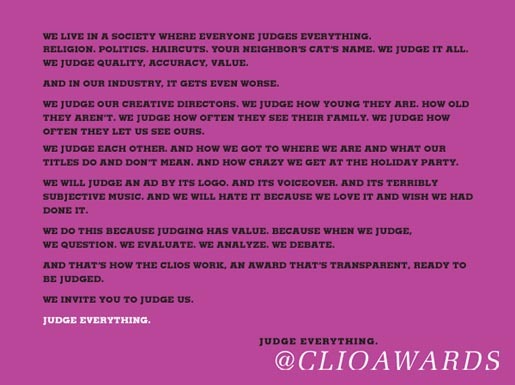 Results are out for the 2012 CLIO Awards. The international competition received over 11,000 submissions from countries as far-reaching as Vietnam, Brazil and Saudi Arabia. Recipients of Grand, Gold, Silver and Bronze CLIO statues were named in 11 different media such as Film, Interactive and Print. The complete list of 2012 CLIO Award winners in all categories is now available at: www.clioawards.com/catalog. 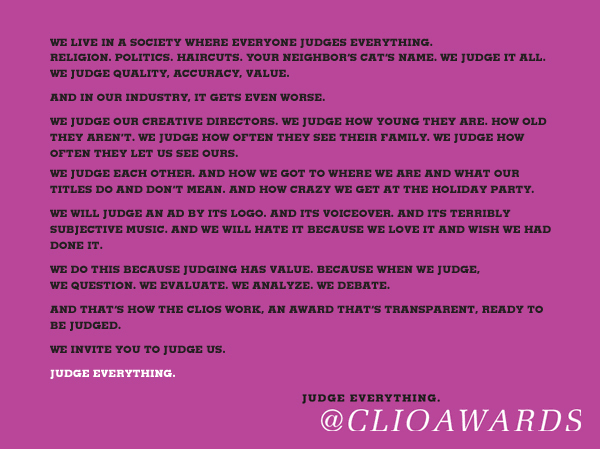 Winning agencies receiving the coveted Grand CLIO Awards this year include Japan’s Projector, Tunisia’s Memac Ogilvy Label and the United States’ Creative Artists Agency in collaboration with Chipotle, in the categories of Interactive, Innovative Media and Film, respectively. 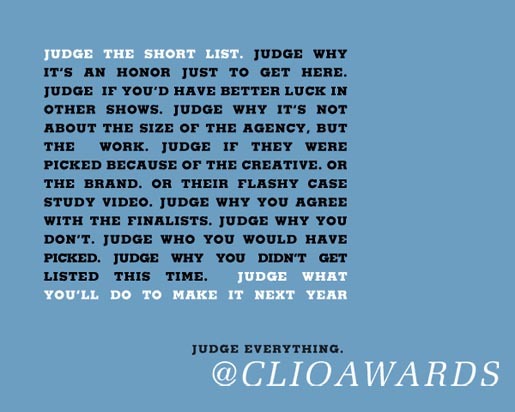 The CLIO Awards will also honor BBDO New York as Agency of the Year, Ogilvy & Mather as Network of the Year, Smuggler as Production Company of the Year, Volkswagen as Advertiser of the Year and Wieden+Kennedy London with the prestigious Hall of Fame Award. The Facebook Integrated Media Award, an award presented in partnership with Facebook to recognize innovative campaigns that incorporate the social networking site with traditional media, will be presented onstage to Leo Burnett Detroit for their work with the Troy Public Library. Winners will be celebrated at the 53rd annual CLIO Awards ceremony on Tuesday, May 15th at New York City’s American Museum of Natural History, hosted by comedy icon Joan Rivers. Annie Leibovitz and Anthony Bourdain will be presented with Honorary CLIOs at this year’s ceremony, while Piyush Pandey, Ogilvy & Mather India Executive Chairman, will receive the 2012 CLIO Lifetime Achievement Award.